After World War II, there was a need for low cost furniture with good design. A competition was even held in the late 1940s, “The International Competition for Low-Cost Furniture Design.” This was to go beyond just solving the problem of affordable housing, as returning soldiers reuniting with their families now needed affordable and comfortable living solutions. Dually, the design process would be an overall attempt to elevate society through functionality and aesthetics (creating the best for the most, as Charles Eames would put it). The inspired challenge would take some of the manufacturing advances made during WWII used to make weapons and apply them to a streamlined assembly process. It would also give manufacturers a needed transition from the diminished wartime production demands. Many technological advances were being made during that time and designers were inspired to meet challenges using these industrial techniques, combined with new materials and innovation. The design team of Charles and Ray Eames became masters at this, as they assembled a team of like-minded individuals to capitalize on mass production of lofty design ideas. They were part of the New Media of their time, as their ideas rippled and made possible many of the design concepts of today. One of their continued successes was the development of the molded armchair. One result of WWII was a shortage in traditional materials and skill sets for making furniture. The days of handcrafted and overstuffed furniture were numbered. The destruction of homes by bombing and demand for hand-crafted furniture no longer produced set the stage for the birth of Utility furniture. These wartime furnishings were sturdy, good design, but the designs were controlled by the Government through the Board of Trade. Everyone’s furniture ended up looking the same. For many, this was still better than what they could have obtained before the war. Post-war conditions saw the continuation of these plain and institutional offerings, at least to the early Fifties. The influence of Swedish Modern and Bauhaus design showed how overworked and overstuffed design could be simplified. Stodgy, utilitarian designs could be elevated and abstracted for visual interest without sacrificing functionality. This led many designers and manufacturers to experiment with more readily available materials, versatility and shape. Ornamental details of the past were giving way to design that was functional, streamlined and comfortable-yet still appealing. In furniture manufacturing, upholstery springs were being replaced by foam rubber. Solid wood was being replaced by layered plywood, fiberglass and plastics. Eventually the Government eased design freedom. Many manufactures went back to their old ways, while others seized the opportunity to show they could do a lot better than the Board of Trade, as far as design. The Eames approached a project by asking if it would be a chance to improve, be interesting and fun. They combine art, science, design, architecture, process, product, style and function. Older upholstery techniques required coils, wading, animal hair, and the laborious skill of hand-built layering. The creativity would come in experimentation on how to apply new techniques and manipulate materials in new ways. The key to solving the design problem was to think outside the box. Charles Eames often used the example in his lectures about the way people in South India used banana leafs as plates to eat their meals – they took an element and exploited existing properties for unintended uses. On a technical level, this meant reducing the number of steps needed to produce a worthy design. Artistically, this meant it had to be visually appealing and clever: a marriage of style and functionality. The main body of the molded chair was designed to be made from one basic piece, with organic curves that cradled the human form comfortably. This would cut down on the number of pieces to be assembled. The first prototype had “rockers” on the bottom, helping to balance and distribute weight. This was just one of many variations to the type of bases that would later be paired with to the shell seat. This would increase the efficiency and payout of production as well, as the modular parts could be interchanged and customized. The customer experience would now be interactive, as they became part of the process through order and purchase. The Eameses gained useful insight from their earlier experiments with molding, gluing and shaping layers of plywood. The goal was to create a body-cradling shape from one piece, dismissing the need for springs and padded upholstery. They resourcefully turned a spare room of their honeymoon apartment into a work studio, and “borrowed” power from nearby public electric poles to accommodate the self-made molding equipment. Charles worked at MGM Studios as a set architect at the time (sneaking home materials), and Ray was doing covers for California Art and Architecture Magazine, as she had a background studying as a painter. They both came from artistically-inclined and creative families, but Charles’ studied architecture on a scholarship which would be added to his arsenal of idea generation. Experimentation and constant refinement took place over the years to beat the challenges of combining elements in ways that had not yet been achieved, such as trying to fit the wire frame base to the organic-shaped plastic shell. With their hands in so many projects, the Eames team transferred lessons learned across the board. Often, meaningless projects gave birth to practical and innovative design solutions. Their approach would have one idea spring-boarding from a previous project. As a result of their earlier experiments in bending and fusing layers of plywood, they were able to use gained knowledge and technique to produce leg-molded splints ordered by the U.S. Navy and nose cones for planes The moneys from this lucrative order financed moving the operation from their home to their first studio and office. Now they could really experiment and expand. The molded chair, like most of the Eames’ creations, was promoted through photography and illustrations, especially to explain the manufacturing steps. These steps took years of trial and error, as prototypes and models were repeatedly developed and reevaluated. Design boards and scaled-down prototype submissions were a requirement for entering design competitions that prompted a range of other rotating projects, each feeding into and resolving design issues of the other. One way the design team researched the optimal shell shape was by experimenting with a wave of wooden dowels aligned vertically, side-by-side, in order to create the most comfortable curve around the human back and bottom. Small adjustments could be made with this segmented approach, and then the calculations were transferred to clay models. These were further refined to improve the visual shape. Earlier in the development, the seat was molded from steel, but since this was cold to the touch, a neoprene coating was added for customer comfort. This also drove up the production price. Partnerships were formed with manufactures more skilled with fiberglass sculpting for racing cars and boats. The fiberglass manufacturer was commissioned to create a mold of the seat shell from a supplied paper model. Since the paper would be destroyed in this process, the manufacturer made two casts, one of which sat in his workshop for almost half a century before being donated to the Smithsonian Institute. Improved techniques in setting fiberglass at room temperature had eliminated the need for heat presses and brought the production cost back down. Years later, plastic would replace fiberglass, as the latter was found to be hazardous to manufacture. One of the biggest obstacles realized during the shift from traditional furniture making was that new techniques the Eames team was developing required the development and creation of the more manufacturing tools to go with it. Much of the equipment for molding, bending, scoring and measuring had never been created. 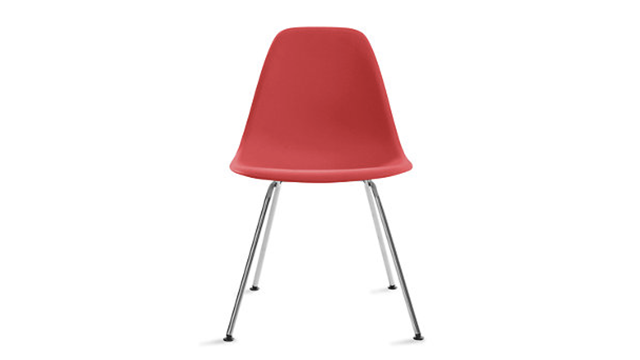 Though the single-piece molded-shell chair was first fashioned from fiberglass, it ended up as the first ever to be industrially manufactured successfully from plastic. Because the Eames were looking forward while others were content to stay put, they were able to see the potential in the versatility of materials like fiberglass and plastic as a tool to construct new structures and shapes. It set the stage for others to copy and reproduce, since they went through the time and trouble to work out the logistics. This is the primary way Charles and Ray Eames approached design. The original fiberglass process took color very well, and Charles and Ray spent a lot of time tweaking the factory specifications to perfection. Color was embedded during the early steps of molding. The initial shape was formed, then the glass threads were added and finally the colored ink was pressurized into the process. The original colors, mostly developed through the fine art painter skills of Ray, were Greige (sort of a gray/beige), Elephant Hide Gray, Parchment, Sea Foam Green, Yellow and Red. These were chosen to compliment as many interiors as possible, again, striving for “the best for the most.” Later, when production would be executed in plastic by Zenith Plastics (then later Century Plastics) for the Herman Miller Furniture Company, a spectrum of colors became available, so as to appeal to an even greater audience. This is an example of where the materials and manufacturing process steered the path to design. Once the challenge of attaching legs to the fiberglass shell was conquered, the bent and welded base options included rod legs, wood legs, a cast aluminum pedestal style, a wire “Eiffel-tower”-like structure, and wooden rockers on wire struts. Later, there became available a new H-shaped leg style with self-leveling glides (“feet”). The interchangeable bases gave the customer “custom” options at mass-produced prices. The fact that these chairs have kept up with the times style-wise as well as improvements in composite materials speaks highly for the molded plastic chair as a timeless, continued success.